Master’s degree in Business Administration/Business Studies/Management/ Economics or related field from recognized University with minimum 6 years of work experience in merchant banking and/or capital market companies. At least Bachelor’s degree in Business Administration/Business Studies/Management/ Economics or related field from recognized University with minimum 3 years of work experience in merchant banking, brokerage house and/or capital market companies. At least Bachelor’s degree in Business Administration/ Business Studies/ Management/ Economics or related field from recognized University. Preference will be given to the candidates with related work experience. > Salary & Benefits will be as per the rule of the company. 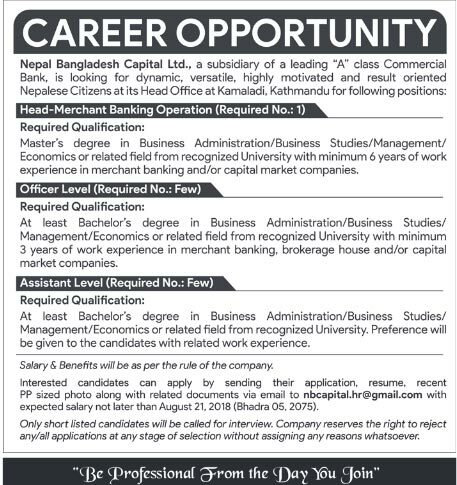 Interested candidates can apply by sending their application, resume, recent PP sized photo along with related documents via email to nbcapital.hr@gmail.com with expected salary not later than August 21, 2018 (Bhadra 05, 2075). Only short listed candidates will be called for interview. Company reserves the right to reject any/all application at any stage of selection without assigning any reasons whatsoever.